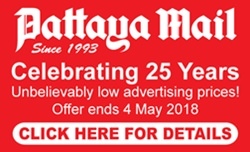 A relatively new, and very lively Pattaya Hotel is the [email protected], which prides itself on being ‘different’. Go to the website and you are met with, “Step into an underwater world of vibrant colors and eccentric detail. [email protected] Design Hotel Pattaya, a refreshing escape yet a provocative immersion! Wow! The copywriter certainly knew how to get your attention! I have written before about the impression that you get as you enter the foyer. It reminds me of standing in a MOCA (Museum of Contemporary Art) and wondering at what the imagination of human beings could produce. The more you looked at the big fish on the wall, the more fantastic it all is. [email protected] is on Second Road just past Soi 3 on your left and opposite Central Marina. The large statue of Matcha-nu in the forecourt will catch your eye (It isn’t Hanuman as it has a fish’s tail), and drive in to the building where there is secure parking. We were invited for their Thai Lunch Buffet at their Seafood Restaurant, called the Big Fish, on the sixth floor, where one side is dedicated to the buffet food, and in the middle there is an island bar. Step out of the lift and you are hit with a blaze of color, many colors and a predominately “fish” décor. Here is an (incomplete) list of dishes on offer. Traditional Pad Thai, Chicken in Pandan, Noodle soup, Vegetables with chilli dip, Prawns, Mussels and Squid on ice, then a row of clay pots, with more Thai favorites as Red curry prawns, Sweet and sour fish, Steamed mixed vegetables, Pork in chilli sauce, Masaman beef curry, Fried rice and Steamed rice. Salads include Lemongrass and shrimp salad, Papaya salad, plus Fish cake served with chilli-pickled cucumber. 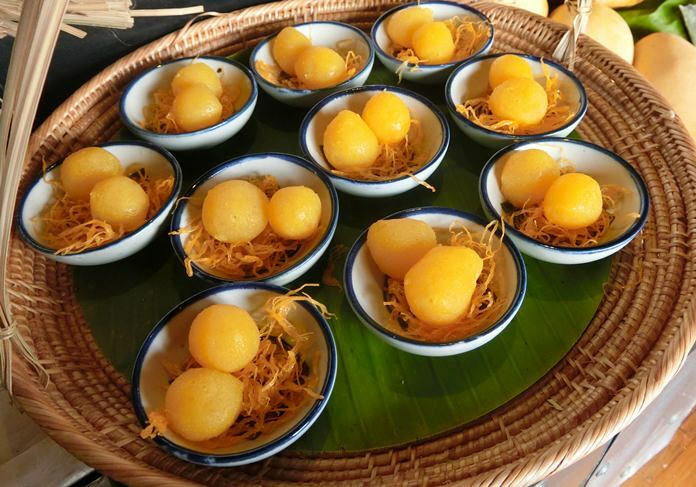 There is also a choice of many different Thai desserts, for me a little sweet, though the sticky rice and mango was very popular. The live cooking stations were manned by friendly staff who all looked as if they were enjoying the chance to present their special dishes to the foreign faces. 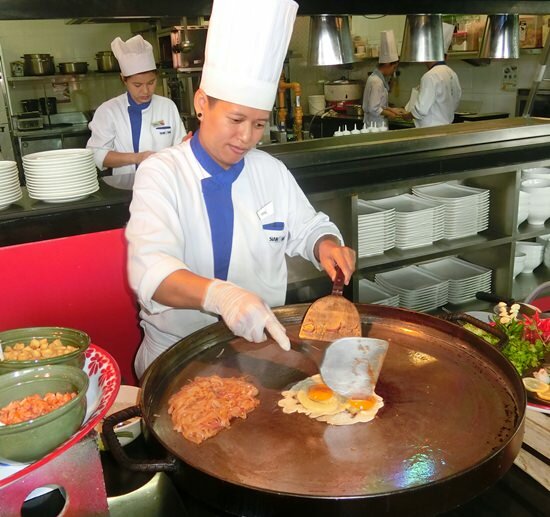 The way the Pad Thai was prepared on the large circular hot plate was keeping the lady very busy. Another had a diaphragm over boiling water to make a steamer where thin pockets of steamed rice were made and wrapped around small sweetmeats. I began with a plate of Pad Thai with prawns, and followed that up with a plate of Beef Masaman, which was excellent with all the ingredients such as peanuts and potatoes as well as hearty beef chunks, and not too spicy. As the buffet does not include alcohol, we drank apple juice which was a welcome change for middle of the day dining. 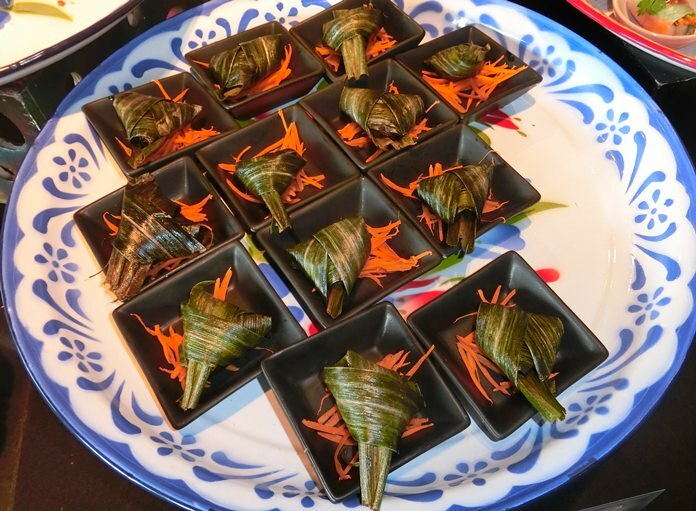 This is a perfect place to take overseas visitors to allow them to experience Thai style cuisine, and see the food prepared at the live cooking stations. Even though it is a buffet, the very helpful staff will bring your selections to your table. At B. 400, including soft drinks, it is also very inexpensive. By the way, the fish don’t fight, nor do we eat Siamese fighting fish (Betta splendens), although they are quite aggressive.